Honourable Chief Minister of Telangana Shri. K Chandrasekhar Rao Garu has high vision of making the state "Bangaru Telangana" (Golden Telangana). Inclusive development of all communities, Empowerment and integration of all marginalised sections of the state is an important first step in the direction of building a Golden Telangana. As part of Minorities development and KG to PG Mission, the Honourable Chief Minister Sri. K. Chandrasekhar Rao Garu has sanctioned total 204 Minorities Residential Schools which includes 12 upgraded Jr. Colleges in 31 districts of Telangana where more than 1 lakh minority students will educate per year. This is a landmark initiative in the Indian history which has created an opportunity to minorities and a stepping stone to educate economically backward minorities children. TMREIS has an excellent track record of establishing 204 Minority Residential Schools in a mere 13 months span in 31 districts of Telangana. These schools are meant for children of poor parents who have a meagre income and economically deprived communities. The objective of having a fully residential school is to focus on the child's overall development. These schools are home away from home where traditional values and complete family atmosphere is maintained 24x7 by trained and caring professionals. The Society aims to provide high quality and free education to the children of most economically backward minorities communities of the state of Telangana, to enable them to avail professional educational courses and jobs in the government and public and private sectors but also to have access to the best opportunities in education on par with other communities. To provide a dynamic educational environment that helps children to face the demands and challenges of a competitive world. • Comprehensive physical, mental and socially relevant development of all the students enrolled in each and every residential school, in their homes, in their village and finally in a larger context. • Focus differently on the educational support to be made available to those standards XI and XII and those in standards VI to X, so that their distinctive needs can be met. • Support the annual expenses in a matter that offers reasonable remuneration to the staff and up keep of the facilities. • Support the construction of infrastructure that provides education, physical, environmental and cultural needs of student life. The sports classes at TMREIS inculcates the best sporting instincts in students and getting children involved socially as well as in physical activities. Teamwork and sportsmanship skills are given utmost importance. The learning environment is conducive integrated with moral and spiritual values leading to a holistic development of each child. All these facilities come in a complete package which is FREE with the cost taken care by the Telangana State Government. Initially, the schools were catering to 5th, 6th & 7th class students but are now upgraded up to Class 9th and will be upgraded every year up to class 12 and already 12 schools are upgraded to Intermediate. Telangana State government is providing free Boarding, Lodging with all the necessities at FREE of cost like Text books, Note books, uniforms, shoes, sports dress, Cosmetic kits, medical care etc. The enrolment in the Colleges for fresh admissions in Intermediate First Year in TMR Colleges for the academic year 2019-2020 is being done ONLINE on TMREIS website (tmreis.telangana.gov.in). Total No. of TMR Schools 204 and Jr. Colleges 2. 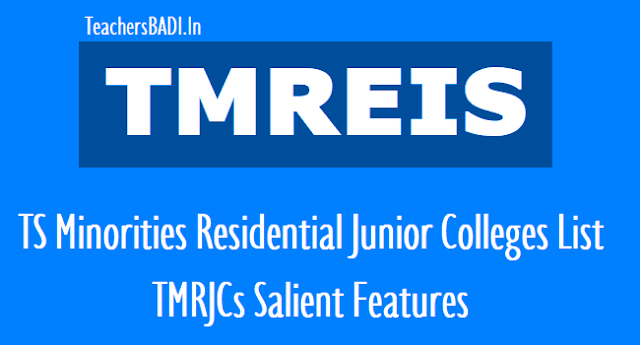 TMREIS is providing the best of child friendly infrastructure to all schools. These facilities are on par with the International Standards. TMREIS has the best technology to help maintain the day to day affairs of running the school and to provide the services required for students education and accommodation. 1. Separate Schools for Boys and Girls. 2. Digital class rooms with multimedia facilities for effective teaching & learning process. 4.Availability of computer Labs with Internet facility to impart computer education. 5.Well-equipped Library with availability of books in all disciplines. 6.Robotics & Engineering Skills Laboratories. 7.Well ventilated, spacious dormitories for students stay. 8.R.O. plant for clean and safe drinking water. The hostels at TMREIS have modern amenities with customised bunker beds in Dormitory area, comfortable Dining Tables, common and recreational rooms, a quiet area and a Library, sufficient Toilets, Bathroom facilities and Geysers for hot water bath. A hygienic and fully staffed kitchen prepares delicious dishes for our students. Hygiene and Quality are absolute priorities. The dietician plans the Menu (Daily Milk with Boost, Egg, Fruits, Snacks and Weekly Chicken / Mutton at TMREIS which is fresh, wholesome, nutritious and plentiful R.O. Plant for clean and safe drinking water. 1. Mathematics, Physics and Chemistry (MPC). 2. Biological Sciences consisting Botany, Zoology, Physics and Chemistry (BiPC). 3. Mathematics, Economics & Commerce (MEC). 4. Commerce, Economics & Civics (CEC). 7. The Curriculum is integrated with EAMCET/IIT- JEE/CA – CPT/CLAT/5 years PG Integrated Course. 8. Our Teachers: Passionate, Well Qualified, Trained &Experienced. Note: Daily Arabic language classes will be conducted in the schools. • Regular free Health check-up of students with qualified doctors. • Availability of Regular Staff Nurse to monitor the Health of students and monitor the Hygienic conditions. • Free medical treatments for sick students. Students are provided with good Quality Nutritious Food as per the menu. • Milk with Boost in the morning. • 4 times Eggs per week. • 6 times Non- Veg (4 times chicken & two times mutton) per month. Safety & Security of students is utmost important in TMR Schools. • 24 Hours Surveillance through CCTV cameras and monitored from Head Office TMREIS. • Arrangements of fire safety Equipments. Following amenities are provided to the students at free of cost. • Text Books, Note Books, Stationary items (Pens, Pencils, Record Books, Geometry box etc. Following services are extended to the students at free of cost. • 24x7 availability of teachers who act as House Master/Mistress or Loco parent to help the student in all respects. To Supplement and compliment the scholastic areas, the following Co-curricular activities are conducted regularly through the following Clubs. In order to nurture the latent hidden talent the following activities are being conducted. • Summer camps (in sports & games) Literacy activities (Debate, Essay writing, Extempore speech, creative writing etc.). • Sprawling play grounds with excellent sports facilities. • Every day Morning physical fitness training and Evening Sports & Games. • Special Training in Sports & Games in different Disciplines for selected Students. In order to develop good rapport between the Parents & School and utilise their collective wisdom and resources for betterment of students regular Parent Teachers Meetings are conducted. 2. Promoting Healthy and Competitive Spirit among the Students, Teachers and Schools. 4. Unique Pedagogy and Personalised Academic Supervision. 5. Round the Clock (24x7) Medical Services. 6. 24x7 Surveillance through CCTV Cameras & Monitoring from Head Office TMREIS. 7. Empowering the Girl Child by conducting regular Life Skills and Personality Development Workshops. 8. Conducting Bridge Courses in all Subjects. 9. Special Classes in English through Karadipath Magic English SLL Programme. 10. Conducting regular Parent Teacher Meetings to utilize their collective wisdom and resources. 11. Conduct of Summer Camps. 12. Daily conduct of Club Activities like E+ Club, T+ Club, W+ Club etc. 13. Encouraging the Students at Younger age to adopt to the future Technology by Organising trainings on Robotics & Engineering Skills. 14. On order to promote Scientific Temper students are exposed to Astronomy in collaboration with Astronomy Society of India. 15. Promotion of Urdu 2nd Language.